What does the FRDI Bill do for you? The need for such specific regulation has arisen following the 2008 financial crisis, which witnessed a large number of high-profile bankruptcies. In this Sept. 15, 2008 file photo, Lehman Brothers world headquarters is shown in New York, the day the 158-year-old investment bank, choked by the credit crisis and falling real estate values, filed for bankruptcy in the US. All PDF which are provided here are for Education purposes only. Please utilize them for building your knowledge and don't make them Commercial. We request you to respect our Hard Work. We struggle hard to gather all these tests and Materials so if anyone subscribed any test series or material please forward us to [email protected], We remove all the tracing items from the pdf and We Respect Your Privacy. If you are new to UPSC field, We recommend you to know about UPSC Prelims and UPSC Mains and also UPSC Optionals for better Understanding. The FRDI Bill is part of a larger, more comprehensive approach by the Centre towards systematic resolution of all financial firms — banks, insurance companies and other financial intermediaries. The Bill comes together with the Insolvency and Bankruptcy Code to spell out the procedure for the winding up or revival of an ailing company. The need for a specific regulation rose following the 2008 financial crisis, which witnessed a large number of high-profile bankruptcies. With the Centre also actively encouraging people to engage more with the banking sector — both through schemes like Jan Dhan Yojana and moves like demonetisation — it becomes critical to protect savers and those joining the formal economy in case a bank or insurance firm starts failing. The Bill provides for the setting up of a Resolution Corporation — to replace the existing Deposit Insurance and Credit Guarantee Corporation — which will be tasked with monitoring financial firms, anticipating their risk of failure, taking corrective action and resolving them in case of failure. The corporation is also tasked with providing deposit insurance up to a certain limit yet to be specified, in the event of a bank failure. The Corporation will also be tasked with classifying financial firms on their risk of failure — low, moderate, material, imminent, or critical. It will take over the management of a company once it is deemed critical. Among other tools, the FRDI Bill also empowers the Corporation to bail-in the company. While a bail-out is the use of public funds to inject capital into an ailing company, a bail-in involves the use of depositors’ funds to achieve those ends. This can be done either by cancelling the bank’s liabilities, or converting them into other forms, such as equity. This has caused a lot of concern among depositors who are worried they may lose their hard-earned money deposited with banks. However, the fact is that the risk is no more or no less than it ever was. The Deposit Insurance and Credit Guarantee Corporation provides deposit insurance of up to ₹1 lakh. The rest is forfeited in the event of a bank failure. The FRDI Bill has not specified the insured amount yet, but it is unlikely to be lower than that amount, as the limit was set way back in 1993. When you move a system from personality-based solutions to rule of law, there is a painful period of readjustment of the old way of doing things to the new. People, institutions and analysts all need to readjust to the new reality. The recent commentary around the Financial Resolution and Deposit Insurance (FRDI) Bill that is up for debate in the winter session of the Indian Parliament has picked up on one section (section 52) of the Bill, ignoring everything else in the 125 pages, and has resulted in panic about the safety of bank deposits if this bill gets passed. I read the Bill over the weekend and this is my understanding of what the aim of the Bill is and what it means for you. What is the problem the Bill aims to solve? It wants to put in place rules of the game so that financial firms can fail in an orderly manner and it provides for insuring your bank deposits. Let’s get some context. Pre-1991, financial firms (banks, insurance, mutual fund, pension) were mainly government owned. In a state-owned and -controlled market, the fear of failure was minimal. The need for sector regulators was not there. As the market expanded to allow in the private sector, the manner of oversight has changed. Sector regulators were born to set up the rules of the game of how a private sector bank or insurance company or mutual fund or pension manager must behave, what they can or cannot do and what happens when they mis-behave. But as markets evolve, the game becomes more and more complex. The 2008 financial crisis brought into sharp focus the perils of an interconnected financial system that could lead to an entire system crashing due to the sudden failure of one firm. Globally, governments have put in place systems and processes for an early warning system of financial firm failure in the form of resolution system. India has seen deep reform in its financial sector and the FRDI Bill is the next step of this journey. The FRDI Bill seeks to put in place a new entity called the Resolution Corporation (RC) that will put in place a system to monitor financial firms such as banks, insurance companies, stock exchanges, and payment systems, so that the ill health of such a firm can be caught early on, rather than allowing it to get sicker and then suddenly come to the brink and fail causing the risk of contagion. But isn’t that the job of the Bankruptcy Regulator? Financial firms such as banks and insurance companies accept deposits and collect premiums from a large number of retail investors who may not be able to come together as creditors and initiate the bankruptcy process. Worse, in initiating bankruptcy, they will be the worst hit since the failure of a bank will hurt the depositors the most. Therefore, the need of an early warning system and a resolution process for financial firms. India doesn’t have a process in place today, though different regulators have their own ways of dealing with it. For instance, the insurance regulator tried to get ICICI Prudential Life to take over the business of Sahara Life earlier this year, and the matter is in court as Sahara has pushed back. The Reserve Bank of India (RBI) has leaned on banks earlier to take over failing banks. So, yes, there is an ad hoc system in place with rules scattered over several Acts, but there is no one process to resolve the crisis in financial firms by one agency. What does the Bill propose? An RC will be set up that has representatives from all financial sector regulators, the ministry of finance and some independent directors. The RC or the sector regulators will put in place rules that will classify financial firms into five categories based on their risk of failure: low, moderate, material, imminent and critical risk to viability. The evaluation of risk will be on the metrics of capital adequacy, assets and liability, asset quality, capability of management, earnings sufficiency, leverage ratio, liquidity of the firm and so on. Both the sector regulators and the RC will classify and monitor firms. The Bill puts in place a process to monitor a firm that is classified as ‘material’ or ‘imminent’ risk to failure, giving the firm and the system time to either recover from the illness, or if it is going towards the terminal stage, to allow the system to prepare for failure. 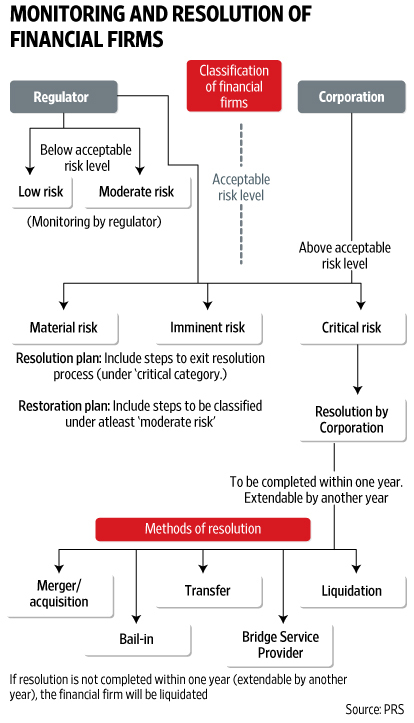 If the firm gets classified as ‘critical’ risk, then the RC has several ways in which it can resolve it. It takes over the administration of the firm on the day it is classified as ‘critical’ and it can use any one or more of five routes to resolve the crisis. One, it can transfer assets and liabilities of the firm to another firm. Two, it can merge the firm or put it up for acquisition. Three, it can create a bridge financial firm to take over the assets, liabilities and management. Four, it can use the bail-in provision or convert the debt of the firm. Five, it can liquidate the firm. What happens to my bank deposits and can these be used in the bail-in clause? The bail-in clause is the opposite of a bail-out. In a bail-out, an external agency helps out a distressed firm. In a bail-in, it is the debt of the firm that is either written off, or subject to a haircut or changes form. Your bank deposit is a liability or a debt for the bank, so can your money be used for a ‘bail-in’? Will you lose your bank deposits? The short answer is: no. Life will be no worse than it is today; it will most likely be a bit better. Today, the Deposit Insurance and Credit Guarantee Corporation (DICGC) insures bank deposits up to Rs1 lakh. The RC will also insure bank deposits and the insured limit will be set in consultation with the RBI. The last revision to the insured deposit amount was in 1993 and the limit is likely to go up to inflation index it, rather than down. There is an additional protection for depositors because the bail-in can be invoked and your deposits be lost only if you have given your consent to the bank when you signed the deposit forms. Do we even need an RC? Surely these are problems faced by large financial firms in the developed markets. The question to me is as strange as somebody asking: do we need air traffic control when the traffic lights on the road work just fine? This line of argument assumes that India will stay where it is and the transition from a $2-trillion economy will not happen. Think of the FRDI as a way to give a process of classification of financial firms based on risks they face and when that risk becomes high, puts in place a rule-based system to resolve the crisis. Do we really have a problem with that? We’ve been through many financial firm failures in the past and they have been resolved by the intervention of the government working with the sector regulator. The failure of Global Trust Bank and its merger with Oriental Bank of Commerce. The merger of the Bank of Rajasthan with ICICI Bank, the ongoing story of Sahara Life are all stories of ad hoc solutions based on a regulator or government leaning on an entity to take over the failing firm. The FRDI debate finally comes down on the intent of the government. Remove the political rhetoric from the provisions of the Bill to see that your bank deposits are safe. Also, it will be a politically suicidal government that will allow bank depositors to lose their money due to bank failure, even beyond the insured amounts. Public sector banks have just got recapitalised to prevent bank failure. That option remains with the government even after the FRDI Act comes into being. As taxpayers, we should worry about the impact of bail-outs that happen when financial firms fail without a process in place, on how our taxes are being used to pay for the inefficiency of banks that made loans they cannot recover. A well-defined system that makes banks more accountable and gives an early warning of ill health is progress, without exposing our deposits to more risk than they face today is progress, isn’t it? Enter your Mail ID and get Access for Everything ! Why is the fiscal deficit widening? Don't Miss Single Material or Test!